Most of us spend a large portion of our days in the seated position. With our busy modern lives commuting to work and then sitting at a desk all day it can be difficult to avoid. How bad is it for our health to sit for most of the day? According to a study published in the Archives of Internal Medicine, researchers discovered that people who sat for 11 hours a day or more were 40 percent more likely to die – from any cause. The researchers also found the chances of dying were 15 percent greater for those who sit between eight to 11 hours a day, compared to those who sit less than four hours a day. A study by researchers at Harvard found that two hours of television viewing a day resulted in an increased risk of type 2 diabetes by 20%, and heart disease risk by 15%. The study also found that more than three hours of daily viewing resulted in an increased risk of dying from any disease. In a review of over 200 studies, presented at the American Institute for Cancer Research in Washington, D.C., researchers found that too much sitting or a lack of physical activity has been linked to causing up to 43,000 cases of colon cancer and 49,000 cases of breast cancer. Dr. Joan Vernikos, former director of NASA’s Life Sciences Division and author of Sitting Kills, Moving Heals, tells us what we can do about the negative impact sitting has on our health. In her research, Dr. Joan Vernikos made an astounding discovery: “Standing was more effective than walking,” she says. And, it wasn’t how long you were standing, but how many times you stood up that made the difference. In other words, she discovered that it is the change in posture, from sitting to standing, that can powerfully counteract damage from excessive sitting. So, if you find you cannot avoid sitting, ensure that you stand up as often as possible to neutralize the negative effects of sitting. Researchers at University College London conducted a study that suggests walking for an hour or two can lower the risk of stroke by as much as one-third, and walking three hours or more daily might cut the risk by two-thirds. A 2010 study from the University of Guilan, Iran put 20 women on a 2-month walking program, consisting of 3 walking sessions per week, 30 min each, at 50 – 75% of maximal heart rate. Not only did researchers discover a 7.7% decrease in body fat, but they found a 5.2% increase in bone mineral density in the hips, and a 7.3% increase in bone mineral density of the spine! Without any dietary changes whatsoever, a review of pedometer-based walking programs found that participants who take 2,000 to 4,000 steps per day (that’s about 1 to 2 miles) can still expect modest weight loss (about five pounds per year). Former NASA director Dr. Joan Vernikos has concluded that the human body needs perpetual motion to function optimally. As Dr. Vernikos states, the good news is that there are virtually unlimited opportunities for movement throughout the day. An estimated 84% of medical claims in the United States are the result of lifestyle choices such as poor diet, lack of exercise, and smoking. Science has showed us the broad range of positive health effects that walking can provide, and now it’s time for us to put this information to use by combining the time we spend at work with the movement of walking. The Treadmill Desk restores movement into our daily lives, while improving mental and physical performance. The best part of all is that it requires no additional time! 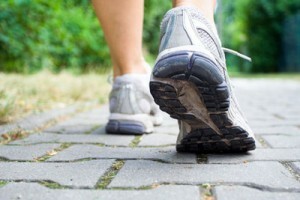 While completing regular work in your office, you can walk for miles and burn well over 1000 calories in a day.